Ethnic rhinoplasty is a nose surgery to create an aesthetically pleasing nose shape but retaining distinct characteristics that are unique to each ethnic group. Back in the 80s and 90s, the mainstream of a rhinoplasty was based on the Caucasian nose shape which was not suitable for other ethnic groups such as Asian, African American, and Middle Eastern. Today’s advanced rhinoplasty approaches to an individual beauty that embraces the heritage and enhances a beauty rather than creating a universal nose design. There is a growing desire in recent patients to get a total cosmetic surgery to fit the overall balance and proportion of the face, instead of a simple nose surgery. Ethnic rhinoplasty requires a full understanding of certain ethnic groups and extensive rhinoplasty experiences to adjust the details according to the needs. Every ethnicity has distinct condition characteristics such as skin, tissues, cartilage, and bone. It is important to find an experienced surgeon who has various experiences in performing rhinoplasty for different ethnic groups. In general, Asians and African Americans tend to have poor tip projection, thick skin, bulbous nose, and weak septal cartilage. These groups of people need the surgeon to ‘build up’ their nose structure using the septal or rib cartilage which is opposite of the Western Caucasian or Middle Eastern rhinoplasty. Western Caucasian and Middle Eastern rather have bulky septal cartilage, excess projection, droopy, or hump nose. For many of the cases, the septal cartilage is mainly used for their nose surgery instead of rib cartilage since they have enough amount of septal cartilage. Asian Rhinoplasty Asians have unique nose characteristics such as low, bulbous, and short nose which is challenging for surgeons to ‘build up’ the nose very naturally. VIP Asian rhinoplasty includes not only the nose surgery itself but also focuses on achieving harmonized face with other facial structures. For this harmony rhinoplasty, a retruded mid-face and columella are elevated, the tip of the nose is projected more, and the length of the nose is elongated. The autologous rib cartilage rather than a small cartilage is the optimal choice for Asian rhinoplasty, as it provides a stability to support the nasal structure and abundant cartilage amount for the design. Therefore, Harmony Rhinoplasty is recommended for Asian Rhinoplasty. Most Asians have a short-depressed nose, short-retruded columella and mid-face retrusion. In Asia, many people use foreign implants such as silicone and Goretex to augment or elongate the nose. Unfortunately, when inserting these implants, there is a high chance of complications such as infection, displaced silicone, extrusion, and skin thinning. Thus, most Asian noses require a surgery using autologous cartilages which include the elongation of the nose, projection of the tip, as well as augmentation of dorsum and mid-face. If the use of foreign implants is inevitable, partial use of silicone implant only at the nose bridge may be helpful. The combination of silicone implant and autologous tissue are common rhinoplasty in Korea. Septal cartilage is weak and not enough in the amount to solely use in rhinoplasty due to a little harvested amount. Ear cartilage is also weak, small in volume, and irregular in shape to support the nasal structure. Therefore, in this circumstance, rib cartilage is a most useful choice of material to perform the rhinoplasty in Asian nose, short nose, damaged nose, infected nose, and mid-face retrusion case. Rib cartilage is enough in amount, strong to support nasal structure, and safe since it is an autologous tissue. Western Caucasian Rhinoplasty Unlike Asians, Caucasians generally have thinner and weaker skin. This means that foreign implants are most likely to be clearly visible if used. For these types, using own natural tissue is the key to the success of the nose surgery. Western people naturally have enough amount of septal cartilage that can be used in rhinoplasty. Deviated septal cartilage from trauma or accident can worsen the shape of the nose and the breathing problem. If there is not enough septal cartilage, rib cartilage can be used to reshape the nose. The doctor’s skill and experience in rib cartilage nose surgery are critical because it requires a precise shaping and well-balanced ratio that prevent an asymmetricity and a breathing problem. Middle Eastern Rhinoplasty Middle Eastern rhinoplasty includes unique ethnic features that require an extensive study of these specific nose characteristics to improve but still reflecting a natural appearance as a Middle Easterner. Many Middle Easterners are stressed due to their deviated septum, which eventually causes a great breathing problem. They also tend to improve their weak tip, droopy, and bumpy nose by a cosmetic rhinoplasty. Therefore, both clinical and aesthetic approaches are significant in Middle Eastern rhinoplasty. The main goals of the rhinoplasty are to create a smooth nose line by improving hump and droopiness. Depending on the patient’s conditions in terms of shape and height of the nose, the doctor will most likely recommend either using a septal cartilage or rib cartilage for the nose surgery. Middle Easterners usually have enough autologous cartilage, so foreign implants are not commonly used. Many Middle Easterners have a well-developed septal cartilage that can be used to correct the septal deviation and create a harmonized nose. African American Rhinoplasty African American rhinoplasty is an ethnic nose surgery for people who have unique features, such as wide nostrils, fatty tissues and skin, deviated septum, protruded mouth, and weak nose tip. Because they tend to have a low and short nose, septal cartilage is merely harvested to use for the nose surgery. African Americans tend to have similar characteristics as Asians since both ethnic groups require a plastic surgeon to ‘build up’ their nose instead of smoothening out the nose line. Most of the time African American rhinoplasty requires a strong material to support thick skin tissues such as rib cartilage that can build the nose structure and elongate the nose length. Removing partial fats or reducing nostrils may be necessary in case of slimming down the wide nose shape. 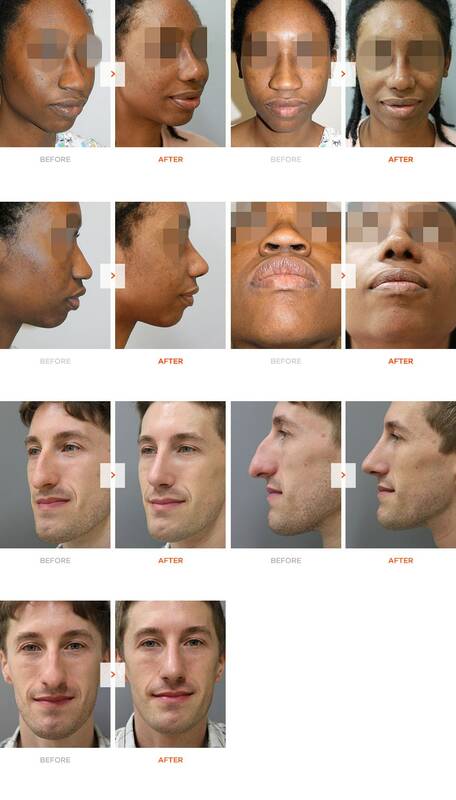 Harmony Rhinoplasty is mostly recommended for African American Rhinoplasty.